Ugh… the number 37 is making me feel rather old… only three more years until the big 40! Ah! Nevertheless, it’s been a fantastically simple and wonderful birthday and one filled with lots of laughter! Taking advantage of Paul being home for the holiday, I slept in. Or at least I slept in a little bit after being woken up by two boys screaming “Happy Birthday!! 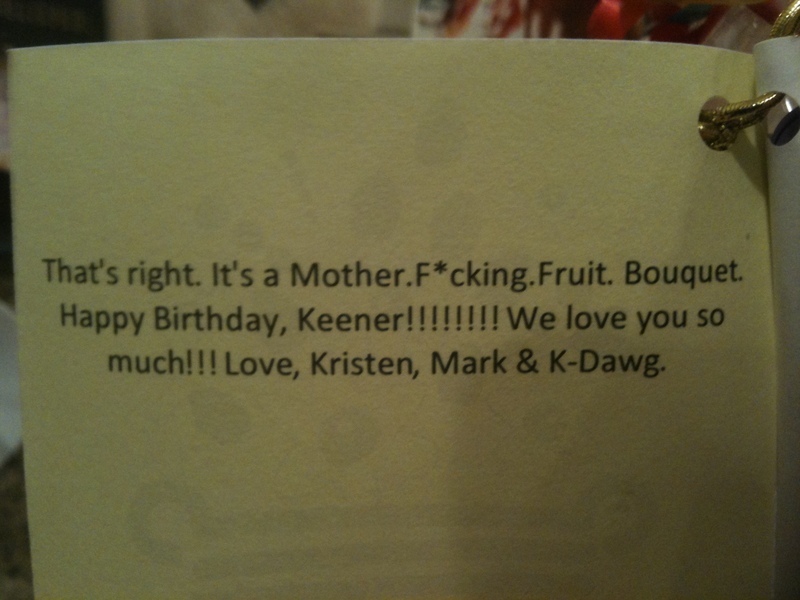 !” at the top of their lungs at 6:45am, handing me my glasses and a birthday card to read. Got to love those boys and their enthusiasm. There was a leisurely breakfast and coffee with Paul and Harper followed by a trip to Tucker’s school to be mystery readers in his class. Fun, fun, fun! The day got a jump-start after that with the arrival of an Edible Arrangements bouquet from friends with a sense of humor only their card can explain and kept me laughing all day. Thanks guys. Here’s hoping the cantaloupe in it doesn’t give me Listeria! I enjoyed an afternoon getting a manicure and pedicure, reading nearly 100 birthday messages and emails from friends and family and taking in some quiet time. Finally it was time to collect the boys and off we went to indoctrinate Paul into the afternoon carpool club and spend some quality time hanging out in the carpool line together. 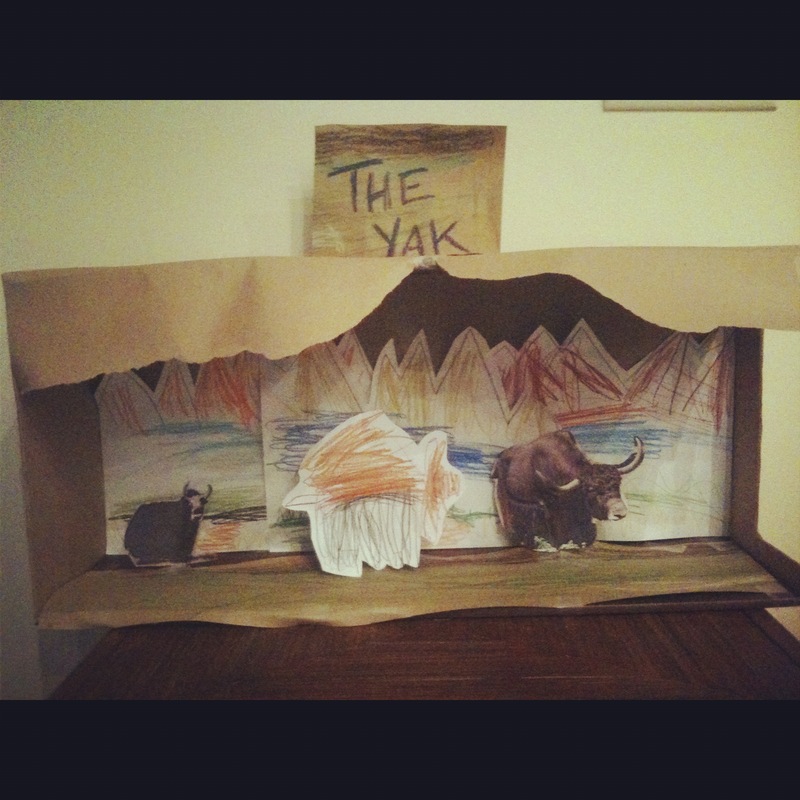 Once home and after more than a few games of Wii bowling, baseball and tennis were played, we completed the final written notes to accompany Cooper’s Yak diorama for his Kindergarten class and watched as he practiced presenting his facts to the family. Finally… after much love and effort, we shared and I enjoyed birthday cake lovingly made by all my boys. The singing was as exceptional as the homemade cake and frosting! Frankly, I can’t think of a better way to spend my day celebrating my 37th year, except to say that I’d do it again! Damn I’m a lucky wife, mother, daughter and friend! Birthday’s rock. Thanks for all the love. If you get Listeria, I think I get a 15% refund and some chocolate covered bananas. …So glad it was great….loved the Utube rendition with the boys singing. May you have many many more healthy and happy years to come filled with joy, love and laughter. Not to worry! 37 is great and…,.40 is not so bad honey! It is the new 30! Hee hee!